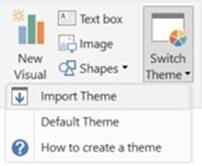 Report theming preview: When you import a theme, all your charts will automatically update to use the theme colors, and you’ll have access to the theme colors from the color palette.You can upload a theme file using the Import Theme option under the Switch Theme button. A theme file is a JSON file that includes all the colors you want us to use in your report. Se my Next article where i explain how to use it. Cross-highlight using multiple series: you can now multi-select multiple series in a chart when cross-highlighting. New Connector: Azure Analysis Services : adding a new connector to allow you to import data or connect live to your Analysis Services instances running on Azure. DB2 connector: option to specify package collection . The DB2 connector dialog now exposes a new option to specify the package collection to connect to, within a given DB2 server. Combine binaries: ability to specify sample file to use. exposing a new control in the file preview dialog to select one of the files available in the selected folder. Default selection is the first file found, but this can now be easily customized by you.